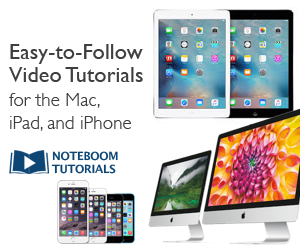 Starting up your iPad is easy. Just press the Home button and your iPad is ready to go in an instant. This quick access to the Home screen and your apps is one of the best features of the iPad. It can also be a liability because anyone can do it, on your iPad, any time. To prevent unauthorized access, you can set a four-digit Passcode. You can also set a longer, more complex passcode if you wish. Enter a four-digit passcode. Then to be sure you meant it, enter the same four digits again. Note – you MUST remember your passcode. Otherwise you can be locked out of your own device. If this happens, you’ll need to restore your iPad on the computer you sync it with. Your passcode is now active and the Passcode Lock screen will be displayed when you wake your iPad. Your Sleep setting (Auto-Lock) and Passcode interval do not need to be the same. For example, you may set your iPad to go to sleep after five minutes of inactivity, but have your Passcode take effect after a longer interval, up to four hours. That way, you won’t need to enter your passcode every time your iPad goes to sleep. 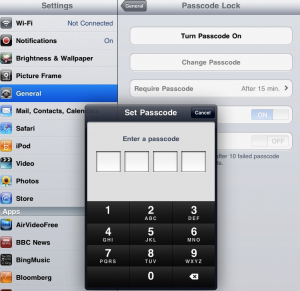 To change Passcode settings: Settings > General > Passcode Lock. Tap Require Passcode. Choose how long you want the iPad to be idle before the Passcode Lock takes effect. Thanks Andy, I have subscribed to your feeds via Google. Check the subscribe section in the sidebar on the right for more info. Check out the iPhone Configuration Utility. While I don’t think it can be used to lock an iPad ‘open’, you could use it to set a specific passcode – and prevent that passcode from being modified by the little darlings. However, I would be very wary of using devices configured this way – anywhere. As soon as you’ve got some sort of personal data on there, even if it’s only your email configured with your password, you want a good passcode. Of course, this might not apply to your classroom situations. So what we need Scott is a no-password lock to prevent others from setting one on shared devices. As you point out, that would be useful in school settings. It would be nice if we could get the passcode turned off in situations where these devices are not 1 to 1. Students always have the ability to “lock” the devices no matter what you do. If you give them passcode, they can unlock and change passcode. If you don’t set one up, they can set it for you.